#1. Do YOU have all the legal documents necessary to best serve you NOW and eliminate all the problems and expenses of the probate process? #2. Do YOU have your "retirement" accounts protected from loss or market risk and STILL have Upside Market Growth Potential & a Minimum Growth rate?. #3. Do YOU have your investments properly allocating in the right investment strategy to MAXIMIZE GROWTH-MINIMIZE RISK & TAXATION and Minimize excessive Fees, Loads, and all Hidden charges(Active or Structured Investment Strategy)? 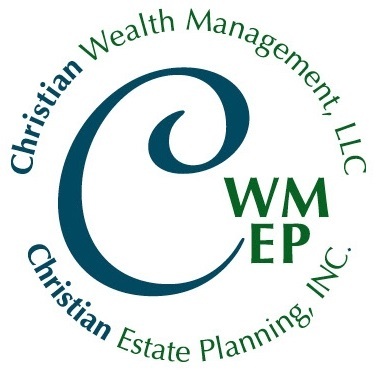 Christian Wealth Management, LLC is a FEE based Registered Investment Advisory firm providing various investment advisory services and a NEW APPROACH to your money management needs! STOP paying excessive Brokerage + Management Fees and then PAY again for the typical investment and Mutual Fund fee, load and charge! Christian Estate Planning, INC. is an Estate Planning company providing complete Estate Planning (legal documents and Revocable Living Trust documents etc...), Life Insurance, Annuity and Long Term Care products and services. Most Brokerage and Financial companies provide ONLY finanacial advise and services. Do your investment have TAX and ESTATE consequences? YES THEY DO! Through the affiliation of these two companies we can provide you with COMPLETE ESTATE AND FINANCIAL PLANNING solutions! Call 703 560-5625 or 703 752-6239 NOW to schedule your Complimentary consultation/evaluation!